CoupItOn is the PUP that uses misleading techniques to prevent removal. Use Reimage to locate malicious components and get rid of them faster than with uninstall instructions. A full system scan blocks virus reappearance and prevents traffic to malicious domains. How does CoupItOn adware work? How did CoupItOn hijack my computer? How to eliminate these intrusive advertisements from my computer? Are you experiencing various interruptions during your browsing sessions? Have you noticed that these ads are entitled as ”Ads by CoupItOn”, ”brought to you by CoupItOn”, ”powered by CoupItOn” or ”CoupItOn ads”? If you are tired of constant pop-up windows that appear every time you click on any link, its means that CoupItOn adware has infiltrated your computer. 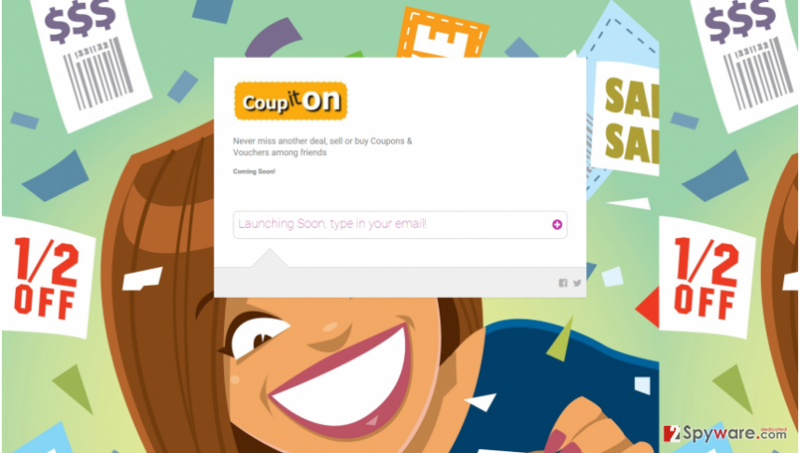 CoupItOn adware claims that is it able to enhance your browsing experience by showing discounts, price comparisons, sales, coupon codes, great deals and so on. However, you should know that this program is hardly beneficial at all because the real objective of it is to advertise its third-party sponsors. That means the advertisements that will be shown for you are likely to be misleading. Let us explain to you how this system works. Firstly, once this adware enters your system(doesn’t matter with, or without your permission), it will install its add-ons and will start to monitor your browsing habits. For example, what websites do you visit, what search terms do you enter in the search engines, what bookmarks you save and so on. It is even capable of recognizing your computer’s location and your IP address. This information is interesting for developers of CoupItOn because it allows them to predict what advertisements would look attractive to you. Be careful – these ads will show up as pop-ups, banners, in-text links and so on. You should know that the majority of these advertisements will not link you to the desired offers and sales. You will possibly be redirected to third-party websites that may promote suspicious software or free updates. Please be mindful and stay away from such offers; sometimes even one click on an unreliable link can initiate an automatic download of a potential PC threat. To avoid such dangers and to ensure the safety of your computer, you should install a reliable anti-malware program, for example, Reimage. You can get CoupItOn adware from its official web page. However, it is not the most frequent method to install this application. Usually, CoupItOn is spread via bundling method, which allows to attach potentially unwanted programs to other legitimate freeware or shareware. In most cases, PC users do not notice such attachments because they are usually hidden in the ”default” or ”standard” installation settings. This is why you should reject these options and opt for ”advanced” or ”custom” mode – it allows to customize your installation. The window should expand, and you should see several statements that claim you agree with the optional installations. Untick all unfamiliar statements, and you are done. To get rid of unwanted interruptions during your browsing sessions, you have to uninstall the CoupItOn virus. You can do it automatically (with a reliable anti-spyware program), or you can uninstall it manually. For that, the 2-spyware team has prepared detailed instructions for you. Follow them, and you will get rid of CoupItOn in no time. Here, look for CoupItOn or any other recently installed suspicious programs. Wait until you see Applications folder and look for CoupItOn or any other suspicious programs on it. Now right click on every of such entries and select Move to Trash. When in the new window, check Delete personal settings and select Reset again to complete CoupItOn removal. Once these steps are finished, CoupItOn should be removed from your Microsoft Edge browser. Here, select CoupItOn and other questionable plugins. Click Remove to delete these entries. Now you will see Reset Firefox to its default state message with Reset Firefox button. Click this button for several times and complete CoupItOn removal. Here, select CoupItOn and other malicious plugins and select trash icon to delete these entries. Click Reset to confirm this action and complete CoupItOn removal. Here, select Extensions and look for CoupItOn or other suspicious entries. Click on the Uninstall button to get rid each of them. Now you will see a detailed dialog window filled with reset options. All of those options are usually checked, but you can specify which of them you want to reset. Click the Reset button to complete CoupItOn removal process. This entry was posted on 2015-10-15 at 04:24 and is filed under Adware, Viruses. You can quickly scan the QR code with your mobile device and have CoupItOn manual removal instructions right in your pocket. How did you remove CoupItOn?